EEG Brain Function Measurement | Health Research, Inc. Many neurological disorders and diseases depend on an accurate assessment of brain function using an electroencephalogram (EEG). Scientists at the National Center for Adaptive Neurotechnologies have developed a new method for measuring cortical excitability. Initial studies of the method have shown a 65% increase in accuracy thereby addressing some of the limitations of scalp-recorded EEG recordings and improving results of EEG applications. 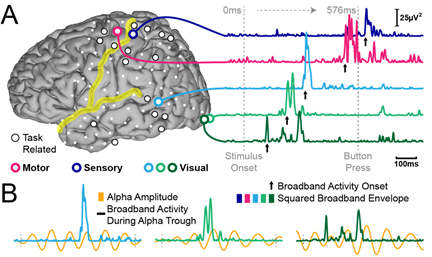 Current methods to provide this assessment typically make measurements of the power or phase of oscillatory EEG activity. In substantial contrast, the principal measurement used in our model is based on instantaneous voltage amplitude of biased oscillations. We recently showed that this measurement is a better predictor of cortical excitability than the traditional measurements of power or phase. Cortical excitability, as measured by oscillatory activity, is a principal index of brain function. The brain regulates cortical excitability by changing specific properties of oscillations across different areas of the brain. For example, hearing a tone compared to seeing something is realized by the brain by increasing excitability in auditory areas of the brain and decreasing excitability in visual ares of the brain. The two most influential theories that attempt to explain these rapid variations in behavior take advantage of measurements of oscillatory power and oscillatory phase. The first hypothesis is communication-through coherence (CTC) whereby the brain attempts to optimize information transfer by synchronizing the timing of oscillatory activity at the sending and receiving sites i.e. neuronal firing occurs preferentially at the trough. In contrast, the second uses a gating-by-inhibition (GBI) hypothesis that suggests neuronal populations that are not related to the task are functionally inhibited by increased oscillatory power in specific frequency bands. While these existing theories have made important progress and justify the measurements of oscillatory power and phase they are based upon, there is evidence that these theories are incomplete and hence oscillatory power and phase measurements may be sub-optimal. We developed a unifying theory, called function-through-biased oscillations (FBO) hypothesis, that synthesizes the CTC and GBI theories. One of its core concepts is that the instantaneous voltage of biased oscillations, rather than oscillatory power or phase, is the most immediate and most accurate index of cortical excitability. Thus, calculating this new index from EEG signals provides a way to improve estimates of brain function or behavior. Importantly, this new calculation method does not require different types of sensors or other changes in experimental or clinical setups. Neuroscience diagnostics – in neurology, newborn care, sleep, balance and mobility and hearing. Increased precision – measuring the depth of anesthesia, the likelihood of impending seizures, neurological biomarkers for neurological disorders such as Parkinson’s, Alzheimer’s, cerebral palsy, etc. Improved treatment outcome in people with stroke, spinal cord injury, attention deficit disorders, substance abuse and chronic pain. Improved functional restoration in people using brain-computer interfaces and/or improved assessment of a person’s brain state during brain mapping. In clinical trials at Albany Medical Center. HRI is seeking commercial partners to license this method for use in EEG and ECoG recording devices in neuroscience diagnostics and therapeutic applications. A general framework for dynamic cortical function: the function-through-biased oscillations (FBO) hypothesis. Schalk, G. Front Hum Neurosci. 2015 Jun 26, 9:352. doi: 10.3389/funhum.2015.00352. eCollection 2015. Diane L. Borghoff, B.S., M.S. Health Research, Inc. – 150 Broadway – Suite 560, Menands, New York 12204-2719 U.S.A.